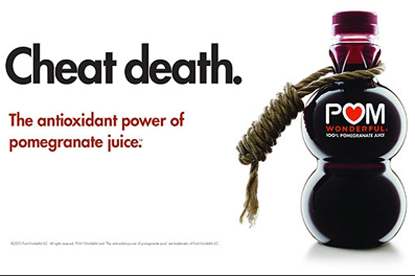 LONDON - A poster claiming that POM Wonderful pomegranate juice could help consumers "cheat death" has been axed by the Advertising Standards Authority. The poster, which showed a bottle of the juice with a severed noose around its neck, attracted 23 complaints from people who felt the ad communicated false and misleading health benefits. POM Wonderful argued that consumers were unlikely to take seriously the obvious untruth in saying that the antioxidant power of the juice could help cheat death. The company claimed that it was a typical technique in poster advertising to use a powerful, yet brief statement to sum up the brand. However, some of the complainants had interpreted the ad to mean that the antioxidant power of pomegranate juice contributed somehow to a longer life. The ASA noted that the claim "cheat death" was an exaggeration, however, it was felt the overall ad text was ambiguous and if read as a health claim, was likely to mislead. The ad must not appear in its current form again.